Sometime early this year, Starlight Studios contacted us for help with their latest stop-motion film project. It’s a story about secret agents, political intrigue — and a young princess who eventually becomes queen. 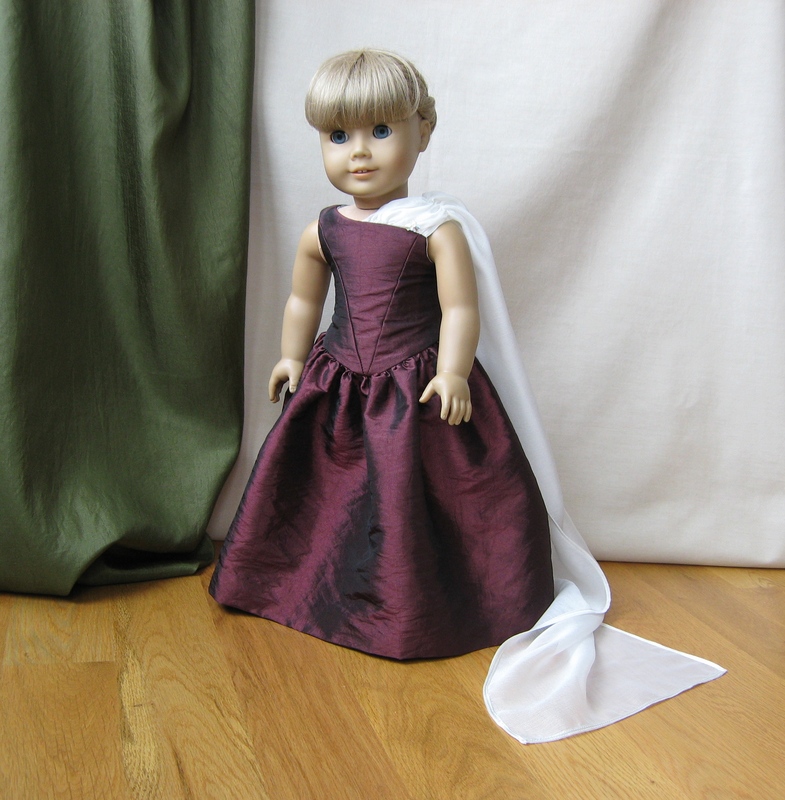 Of course, she needed a dress for the coronation ceremony, and that’s where we came in. Sitara, the Studio’s artistic director, really liked the look of the Statement in Taffeta, but, unfortunately, it had already sold out. So we did came up with some ideas that would be reminiscent of, but not identical to, the original dress. 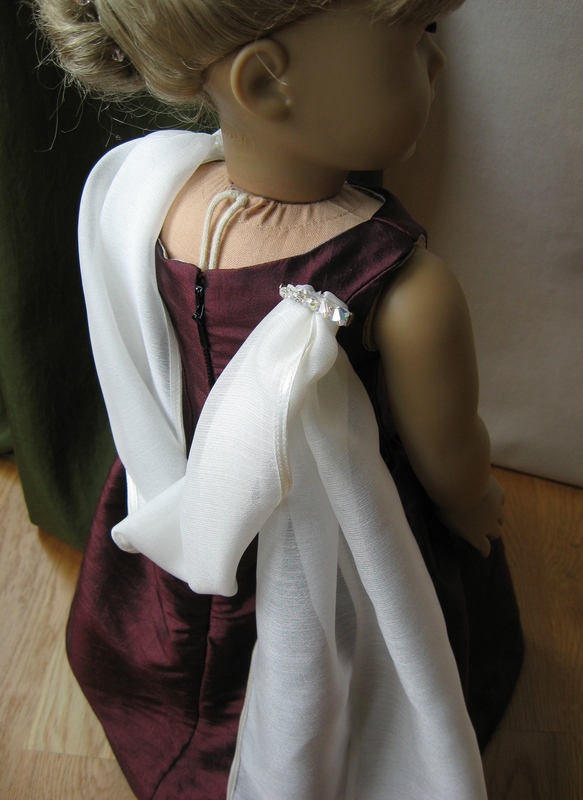 Sitara loved our idea of extending the shoulder strap to make a long chiffon drape. Originally we’d intended to pin the drape in place as shown in the picture on the left — a gentle, almost Grecian, sort of chiffon swathe. But when we had sewed it to the dress at the shoulder, we found that the possibilities for arranging it were endless! We thought of looping it across the back, wrapping it around as a shawl, or simply leaving it down to make a long, graceful train. Since we loved all these ways of arranging it, and thought the people at Starlight would have fun figuring out the best way to present it in the film, we left the drape hanging free. However, we made up a pin covered with silk and Swarovski crystals so that if the Studio decides they’d like it pinned up for the film, they’ll be able to do it easily and with flair. 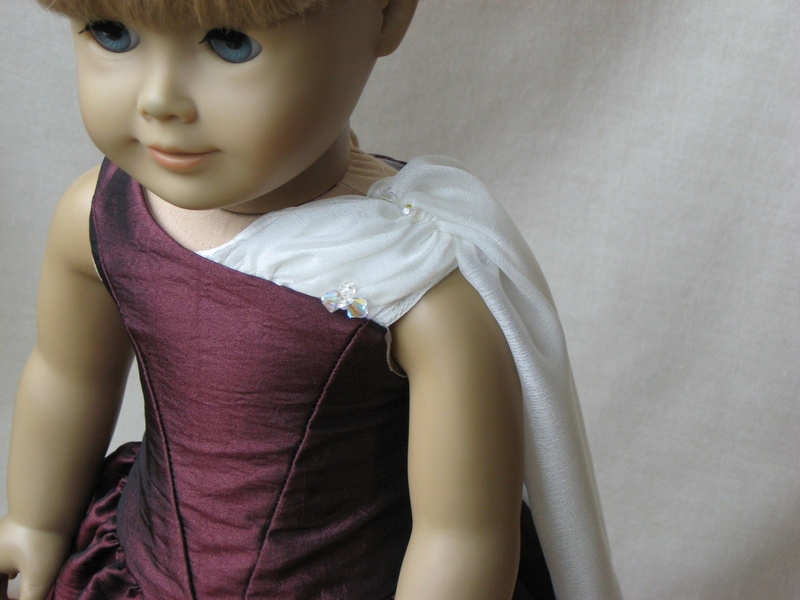 We also put Swarovski crystals on the front of the dress, where the shoulder strap meets the main bodice. It’s a subtle touch, but it definitely adds to the royalty of the gown. Beautiful! 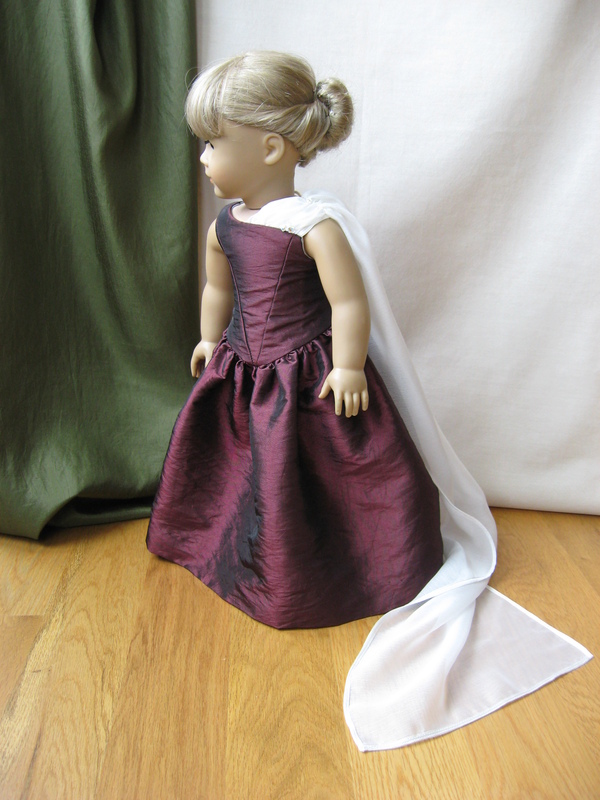 I love the deep color–and the drape looks lovely, too. I like how it contrasts and can be rearranged all different ways. 🙂 Maybe this is the secret gift she keeps talking about on her blog? Anyway, beautiful, as usual, and I love the delicate touch of the swarovski crystals. BEAUTIFUL! I love it! It’s so elegant, and everything compliments each other PERFECTLY! Love it! Wow, that is stunning! I love the colors, and the draping. It looks so elegant, and perfect for a princess! Lovely! I love the drape, very elegant. I love that dress! It looks like a med-evil queen’s dress. You are very creative and I love your doll clothes!! I would no doubt say that this dress by far exceeds standars of what princesses wear nowadays. This dress, considerably, is more or less perfect 🙂 The crimson colour matches perfectly. I remember seeing Sitara’s post about a surprise and sending the link to it. When I did click, I found this marvelous beauty on my computer screen! The color is so unique, too, like a brownish-purple color. Have fun filming in this, Ruthie! Oh wow I was wondering about Sitara’s gorgeous dress! You all do such amazing work! We have a summer movie coming up, including a few rich socialites and we’d love to have something made for one of them! This is so royal. Princesses would beg on their knees for a dress like this. How do I buy the coronation dress I want it sooooooooooooo bad!!!!!!!! 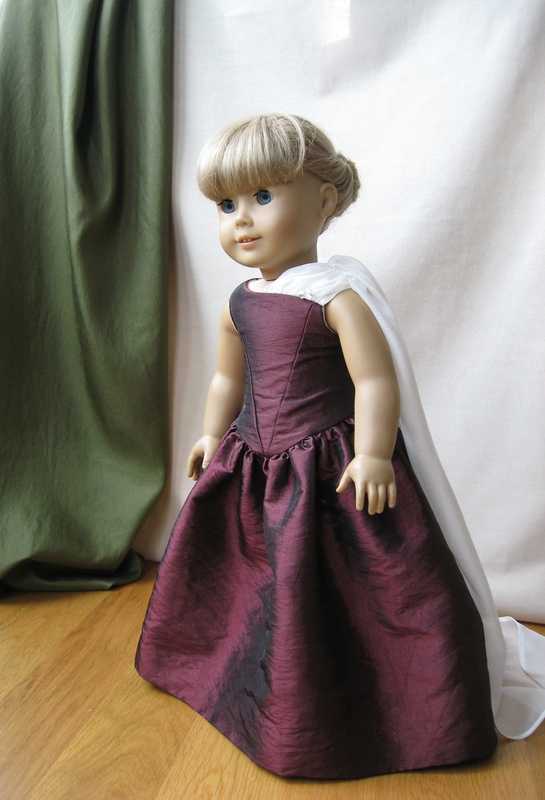 The Coronation Dress was a one-of-a-kind custom order, so unfortunately it isn’t available for sale. I have loved this dress since I laid eyes on it! I’m planing to do something like this but with my own touch. You did amazing! Sitara is lucky! Good job! Wow! That dress is beautiful!